"The US supports his 'Middle Way' approach of neither assimilation nor independence for Tibetans in China"
"I remain convinced that most human conflicts can be solved through genuine dialogue conducted with a spirit of openness and reconciliation"
Sooner or later China will have to follow the world trend and in the long run there is no way that China can escape from truth, justice and freedom. The present state of affairs in Tibet does nothing to alleviate the grievances of the Tibetan people or to bring stability and unity to the People's Republic of China. Sooner or later, the leadership in Beijing will have to face this fact. The Tibetan people do not accept the present status of Tibet under the People's Republic of China. At the same time, they do not seek independence for Tibet. This timeline does not attempt to be exhaustive, but rather, give the key points in the struggle for freedom and the history of the Middle Way Approach. The People's Liberation Army of China invades and starts to assume control of Tibet. In 1951, the Chinese government force the Tibetan representatives to sign the “17-Point Agreement on Measures for Peaceful Liberation of Tibet”. The Chinese government violates the provisions of the agreement and fails to abide by it. With resistance taking place in various parts of Tibet in the late 1950s, a National Uprising also breaks out in the Tibetan capital, Lhasa, in March 1959. Chinese forces crush the uprising, leading to the deaths of 87,000 Tibetans in seven months. Fleeing the Chinese occupation of Tibet, approximately 80,000 Tibetans follow His Holiness the Dalai Lama across the Himalayas and into exile in India, Nepal and Bhutan. 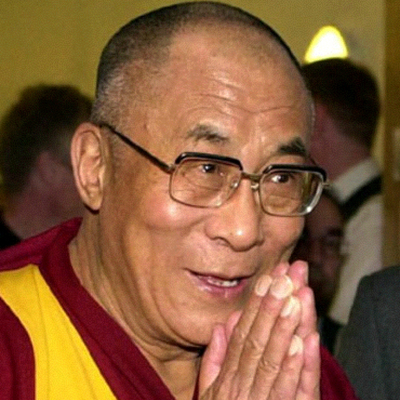 Thanks to the support of the Government of India, His Holiness the Dalai Lama makes a base in exile in northern India. He first settles in Mussoorie and then later in Dharamshala, where the Central Tibetan Administration (CTA) is established. In the coming years, with the support and guidance of His Holiness the Dalai Lama and the CTA, Tibetans in exile concentrate on establishing themselves in communities around the world. During this period, the UN General Assembly adopts three resolutions on the issue of Tibet, in 1959, 1961 and 1965. Chinese paramount leader, Deng Xiaoping, states that, "apart from independence, all issues can be discussed" and offers talks with His Holiness the Dalai Lama. Since the Middle Way Approach has already been developed, a positive response is sent to Deng Xiaoping, beginning a long period of contact and discussions between Dharamshala and Beijing. China accepts four fact-finding delegations to Tibet, in August 1979, May 1980, June 1980 and June 1985. The delegations are enthusiastically received by local Tibetans. They visit various parts of Tibet, including Lhasa, Shigatse, Lhokha, Kongpo Nyingtri, Sakya, Lhuntse, Tsona, Tsethang, Gyangtse, Choekhorgyal, Sangagchoeling and Yartok and Nakartse in U-Tsang; Kanlho, Siling, Golok, Malho, Ngaba and Zoege in Amdo; Nagchu, Chamdo, Dege, Kardze, Nyarong, Gyalthang and Markham in Kham. In 1982 and 1984, Chinese leaders meet exploratory delegations from Dharamshala for talks in Beijing. Following the 1985 fact-finding delegation, China refuses to receive further missions. No reason is given. His Holiness the Dalai Lama addresses the U.S. Congressional Human Rights Caucus and presents a Five-Point Peace Plan for Tibet, proposing the Chinese government to start earnest negotiations based on the Middle Way Approach. In 1987, a large-scale peaceful street protest which breaks out in Lhasa is brutally suppressed by Chinese forces. A new wave of repression and arrests ensues. In 1988, His Holiness the Dalai Lama presents the Strasbourg Proposal in the European Parliament, which elaborates on the Five-Point Peace Plan. In September, Beijing announces its willingness to negotiate with Tibetans and says that His Holiness the Dalai Lama can choose the date and venue for negotiations. Welcoming Beijing's willingness, Dharamshala announces a six-member Tibetan negotiating team. Before the talks can begin, the Chinese government reverts to its former hard-line position and says that the Strasbourg Proposal cannot be the basis of talks. His Holiness the Dalai Lama is awarded the Nobel Peace Prize for his advocacy for a peaceful solution to the issue of Tibet based upon an approach of tolerance and mutual respect. His Holiness the Dalai Lama declares the Strasbourg Proposal invalid due to a lack of positive response from the Chinese government. With Beijing failing to reciprocate the numerous diplomatic initiatives of His Holiness the Dalai Lama, 14 years of formal contact with the Chinese government come to an end. The next year, 1994, Beijing holds the third “Tibet Work Forum” during which it adopts a hard-line policy on Tibet. This marks a significant shift from the more open approach of earlier forums. Given Beijing‟s change in stance, His Holiness the Dalai Lama proposes a referendum of the Tibetan community be held for future dealings with China and to reorientate the course of the Tibetan freedom struggle. In September 1997, based on the preliminary opinion survey and reflecting the Tibetan people‟s profound trust in His Holiness the Dalai Lama, the TPiE adopts a unanimous resolution stating that he should, in the future, be the sole person to take decisions on Sino-Tibetan issues. The TPiE further resolves that whatever decisions His Holiness the Dalai Lama takes will be regarded by all the Tibetan people as being the equivalent to a decision reached through a referendum. During the 29th anniversary of the Tibetan people's National Uprising Day on 10 March, His Holiness the Dalai Lama in his public statement responds to the events of the previous year, thanking the people of Tibet for the trust and hope placed in him and reiterating his commitment to the Middle Way Approach. His Holiness the Dalai Lama addresses the plenary session of the European Parliament, urging the resumption of dialogue. Dialogue with China resumes with the first of what will become nine “rounds of talks” based on the Middle Way Approach. The 1stround of talks between the envoys of His Holiness the Dalai Lama and the representatives of the Chinese government takes place in September 2002 in Beijing. This is followed by the 2nd round in May-June 2003 in Beijing; 3rd round in September 2004 in Beijing; 4th round in June-July 2005 in Berne, Switzerland; 5th round in February 2006 in Guilin city in China; 6th round in June-July 2007 in Shanghai and Nanjing; an informal meeting in May 2008 in Shenzhen; 7th round in June-July 2008 in Beijing; 8th round in October-November 2008 in Beijing and 9th round of talks in January-February 2010 in Hunan province and Beijing. During the first half of 2008, unprecedented and widespread protests break out across Tibet. At the 7th round of talks with the Chinese government in July 2008, Chinese negotiators ask the Tibetan leadership to put in writing the nature of the autonomy it seeks. The Memorandum on Genuine Autonomy for the Tibetan People is presented during the 8th round of talks in October-November that year. The Memorandum elaborates how genuine autonomy for the Tibetan people would operate within the framework of the PRC constitution and Law on National Regional Autonomy – defines areas such as the “application of a single administration for the Tibetan nationality in the People‟s Republic of China”, the “nature and structure of autonomy” and the “11 Basic Needs of Tibetans”. The Chinese leadership rejects the proposal, falsely claiming that the Memorandum includes references to a “Greater Tibet”, “Higher Degree of Autonomy,” “covert independence” and “independence in disguise”. Tibetans begin setting themselves on fire to protest against the Chinese government‟s continued occupation of Tibet and political repression, religious persecution, cultural assimilation and economic marginalisation of its people and environmental destruction. While attempting to take their lives, self-immolators consistently call for the return of His Holiness the Dalai Lama to Tibet and freedom for the Tibetan people. To address the Chinese government‟s concerns about and objections to the Memorandum, the Tibetan leadership presents a Note on the Memorandum on Genuine Autonomy for the Tibetan People during the 9th round of talks. The Memorandum and the Note describe how a genuine autonomy for the Tibetan people would operate within the framework of the People‟s Republic of China: its constitution, territorial integrity and sovereignty, its „three adherences‟1 and the hierarchy and authority of the Chinese Central Government (CCG). The Note further addresses specific concerns raised by the Chinese government with respect to the form of single administration; political, social and economic systems; public security; regulation of population migration; language; and religion. The Chinese government once again refuses to accept the proposal. After President Barack Obama meets with His Holiness the Dalai Lama in July 2011, the White House applauds “the Dalai Lama‟s commitment to non-violence and dialogue with China and his pursuit of the Middle Way Approach,” and encourages the relevant parties to engage in “direct dialogue to resolve long-standing differences”, saying that “a dialogue that produces results would be positive for China and Tibetans.” The Tibetan leadership, headed by the Sikyong, Dr. Lobsang Sangay, reiterates its firm commitment to the Middle Way Approach and clearly states that dialogue between the envoys of His Holiness the Dalai Lama and the representatives of the Chinese leadership is the only way forward. So far, 130 self-immolations have taken place inside Tibet since 2009. Dialogue between envoys of His Holiness the Dalai Lama and the Chinese leadership remains stalled. Meanwhile, many governments – including the U.S., European Union, France, Japan, Australia, Brazil, and New Zealand – hail the dialogue process as a viable and reasonable way forward. Despite worsening conditions inside Tibet and self-immolations now numbering more than 130 people, the Tibetan people‟s commitment to the Middle Way Approach is unwavering. They are buoyed in their faith in the policy by growing support from the international community, including the many Chinese who believe in peace and justice. Successive fact-finding delegations and representatives have visited many areas of Tibet since Sino-Tibetan contacts were established in 1979. The contacts have allowed Tibetans in Tibet and in exile to visit to each other. They have also allowed more than 10,000 students, monks and nuns, to study in exile. Many high lamas, geshes and scholars from all the religious traditions in exile have been able to visit Tibet and carry out religious and cultural activities. The Central Tibetan Administration’s position has received endorsement and solid support from a large number of educated Tibetans in Tibet. For example, Tibetan leader Baba Phuntsok Wangyal, said “[Observers think that] the Dalai Lama’s ‘Middle Way Approach’ of ‘seeking only a meaningful autonomy for Tibet rather than independence’, in the present historical context, is an expression of the great responsibility he takes in giving serious thought over the fundamental interests, future and fate of Tibet and the Tibetans as a whole. It also shows that he takes great responsibility in understanding the issues concerning both sides and in carefully studying the changing circumstances. Furthermore, it is a thinking that is based on reality and foresight. Chinese scholars, activists, writers, public personalities, and countless people worldwide have been able to take part in activities supporting Tibet. For example, in recent years, some 900 articles have been written by Chinese scholars in support of the Middle Way Approach. They include: Federalism is the Best Way to Resolve the Issue of Tibet, The Dalai Lama is the Key to Resolving the Tibet Issue, The Middle-Way Approach is Panacea for Curing the Disease of Ethnic Animosity, The Dalai Lama’s Middle-Way Approach is the Right or Perfect Way of Resolving the Issue of Tibet and The Middle-Way Approach is a Golden Advice. Similarly, as a result of improved understanding and co-operation with the general Chinese public, we have been able to establish Sino-Tibetan friendship associations. His Holiness the Dalai Lama has been able to carry out his spiritual and temporal activities all over the world. Moreover, the Central Tibetan Administration has been able to lead the international community in directing their collective energy towards resolving the issue of Tibet. Since the adoption of the Middle Way Approach, His Holiness the Dalai Lama has received many international awards and recognitions, including the Nobel Peace Prize, and has met with important world leaders. Furthermore, many parliaments have adopted resolutions and established parliamentary support groups for Tibet. In short, Tibet has received open support from governments and parliaments across the world. The Central Tibetan Administration and its activities aimed at resolving the Tibetan issue have not encountered any international legal or political hindrance. In fact, many governments are taking a keen interest in the Sino-Tibetan dialogue, and, in order to bring about a substantive negotiation, an increasing number of these governments are willing to play a meaningful role in facilitating it. Many governments have officially stated their support for the Middle Way Approach, including the U.S. India, Britain, France, Germany and Australia. In the past two years alone, declarations, resolutions and motions of support for the Middle Way Approach have been passed in parliaments in the U.S. European Union, France, Italy, Japan, Australia, Brazil and Luxembourg, amongst others. Supporters of the Middle Way Approach for a Genuinely Autonomous Tibet include global leaders such as U.S. President Barack Obama; Navi Pillay, High Commissioner for UN Human Rights; Lady Catherine Ashton, High Representative for European Union Foreign Affairs/Security Policy/Vice-President of European Commission; Taiwanese President Ma Ying-jeou, Elie Wiesel, a Nobel Peace Laureate. From inside Tibet, the late Panchen Lama openly expressed support for the Middle Way Approach as well as Baba Phuntsok Wangyal, a senior Tibetan member in the Chinese Communist Party. Tibetans were able to clearly understand the Chinese government’s doubts, concerns and position as a result of the several rounds of talks. Tibetans were able to demonstrate that their aspirations are based on reality. They were able to convince the world that their aspiration is not only just and valid, but also appropriate and reasonable, which in turn exposed the Chinese government’s intransigent position. By presenting the Memorandum on Genuine Autonomy for the Tibetan People to the Chinese government, Tibetan negotiators firmly established the basis for future negotiations. The Middle Way Approach is the option to address the current situation inside Tibet which has enjoyed the strongest international support. Many national governments have officially stated their support for the Middle Way Approach, including the U.S. India, Britain, France, Germany and Australia. In the past two years alone, declarations, resolutions and motions of support for the Middle Way Approach have been passed in parliaments in the U.S. European Union, France, Italy, Japan, Australia, Brazil and Luxembourg, amongst others. The Middle Way Approach is receiving more support every year from the Chinese community. Global leaders such as U.S. President Barack Obama; Navi Pillay, High Commissioner for UN Human Rights; Lady Catherine Ashton, High Representative for European Union Foreign Affairs/Security Policy/Vice-President of European Commission; Taiwanese President Ma Ying-jeou, Elie Wiesel, a Nobel Peace Laureate. From inside Tibet, the late Panchen Lama openly expressed support for the Middle Way Approach as well as Baba Phuntsok Wangyal, a senior Tibetan member in the Chinese Communist Party. Help us restore freedom in Tibet through non-violence, dialogue and genuine autonomy. 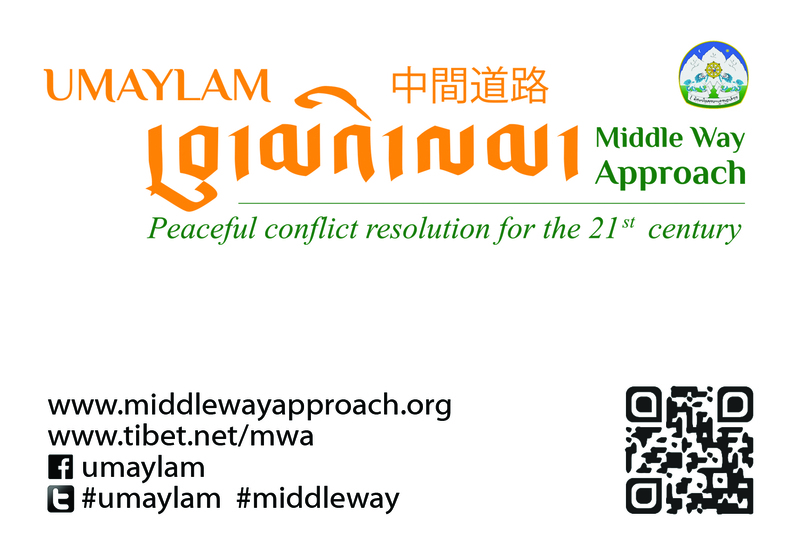 Be a part of the UMAYLAM campaign, the Middle Way Approach. The Middle Way Approach represents the official position of the Tibetan people on how to peacefully and sustainably resolve the current situation in Tibet. It is a position that is also shared by His Holiness the Dalai Lama. “Like”, "Share", and "Comment" on the UMAYLAM Campaign website and promotional materials directly on Facebook, Twitter, and other social media channels. When you share information about the Middle Way Approach, make sure to include the hashtags #middleway or #umaylam and/or this website: mwa.tibet.net Encourage others to continue "sharing" all posts and tweets. Write about the current situation in Tibet and the Middle Way Approach on your blog. Write to or call the media in your area and encourage them to cover stories on local Tibetans and mention the Middle Way Approach in their stories. Contact the office of your local elected representative and let them know about the Central Tibetan Administration's position on Tibet, the Middle Way Approach. Tell your friends and family members about the Middle Way Approach. Inform your local community organization (e.g. Church, Rotary Club, etc.) about the current situation in Tibet and the Middle Way Approach as a peaceful means of conflict-resolution. Organize events to inform people in your community and network about Tibet and the Middle Way Approach, followed by a discussion/Q&A session. Invite special guest speakers and screen the UMAYLAM documentary (available on the Home page of this website and on YouTube). 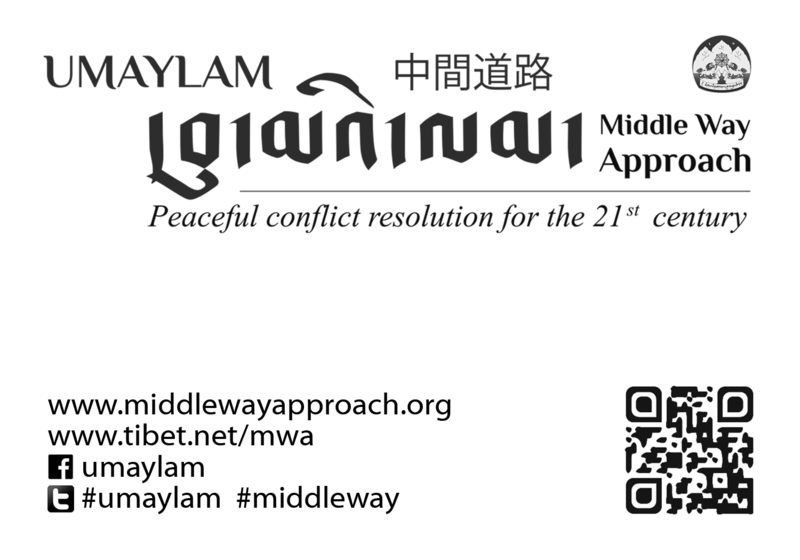 Download, print, and post this flyer wherever potential supporters of the Middle Way Approach may see it. Undertake a public education session on the Middle Way Approach during large community gatherings. Arrange activities such as roundtables, lectures and training sessions where the issue of Tibet can be discussed and explained to communities and friends. Explain the Middle Way Approach and refer individuals to the section of the website in Chinese (mwa.tibet.net/cn). Emphasize key elements of the Middle Way Approach i.e. genuine autonomy within the framework of the Chinese constitution, The 11 Basic Needs of Tibetans, etc.